You have probably noticed over the past few years that many of your favorite websites have moved from HTTP addresses to HTTPS. The added letter, while adding very little time and effort to type, adds immense value and security to those websites. Not only will having a WordPress HTTPS site make your business more trustworthy to visitors, but it will also rank higher in searches. If you have heard of end-to-end encryption, this is that. Only the two clients involved in the transaction can read the data. Anyone who might intercept it will see a garbled mess of characters that are theoretically uncrackable. Sounds pretty good, right? So how does one get this digital force field? Via SSL. [SSL] is a protocol used by applications to communicate securely across a network, preventing tampering with and eavesdropping on email, web browsing, messaging, and other protocols. All modern browsers support the TLS protocol, requiring the server to provide a valid digital certificate confirming its identity in order to establish a secure connection. It is possible for both the client and server to mutually authenticate each other if both parties provide their own individual digital certificates. These certificates were once incredibly expensive and out of reach for pretty much everyone but the biggest websites. You’d see the green lock on sites like Amazon and Twitter, but everyday, run-of-the-mill WordPress sites (like most of ours) couldn’t pay the thousands of dollars it cost to purchase the certificate. Lucky for all of us, as SSL certificates have become more necessary for both ranking and actually conducting business, the price has not only dropped but outright vanished for the majority of sites. There are a number of services now that offer free SSL certificates, including most hosts. You can get a WordPress SSL certificate pretty easily and without much hassle. The primary provider of free SSL certificates these days come from a service called Let’s Encrypt. By using their services, you get all of the benefits of having an SSL certificate without spending a single penny. And here’s the best part: Most major hosting providers are partnering up with Let’s Encrypt to make installing an SSL certificate totally painless. You can get a free SSL certificate from Let’s Encrypt in one of two ways. As I mentioned, many hosts are partnering up with Let’s Encrypt to add free SSL certificates directly inside their customers’ cPanel dashboards or the host’s dashboard itself. For example, if you’re hosting at SiteGround (as I am), you can install an SSL certificate in about two seconds. From the main login site, go into the My Accounts tab and into Extra Services. You should see a section called Let’s Encrypt Certificates, and you can manage and install them wherever you want by clicking the View All button. Additionally, you can click on the Go to cPanel button and find the Let’s Encrypt logo under the Security heading. It takes you to the same page as View All does. Whether you install a Wildcard (for all subdomains on the parent) or not, when you press the Install button, your WordPress SSL certificate is on its way. The server will process your new WordPress SSL certificate installation. Easy peasy. You are almost done. We still need to configure it, though. Which is below in the next section. Also, read through this full list of web hosts who offer direct support for Let’s Encrypt. The process for most supported hosts should be similar to SiteGround. Additionally, some hosts may charge you for using Let’s Encrypt. It’s kind of a bogus charge, honestly, and many hosts who charge are nixing the fee as Google makes SSL the web standard. If yours doesn’t offer it for free, it may be time to consider a different host because they do not have your best interests in mind. If your host doesn’t support Let’s Encrypt, you may still be able to get your free SSL certificate by using a website called SSL For Free. The site will help you configure Let’s Encrypt certificates. But, you will need access to your site’s FTP details and potentially support from your host. While this method works, it’s very hands-on, and you may have to manually renew your certificate when it expires. Because of that, you should try to find a host that offers direct Let’s Encrypt support because it greatly simplifies the process. If you can’t for one reason or another, SSL For Free is your best second option. Additionally, you can get free SSL certs from both Cloudflare and FreeSSL. Cloudflare offers a shared SSL certificate on their free plan. If you’re already using Cloudflare, this is a great way to get your site up and running with HTTPS. Then there’s FreeSSL . While it’s not publicly available yet, this is a free SSL certificate project from Symantec. Nonprofits or startups can get FreeSSL right now. Otherwise, you can sign up to be notified when it goes public. If you choose to go this route and manually install the certificate, Sucuri has a fantastic guide that will take you step-by-step through the installation process. Keep in mind, though, manually installing SSL will require you to use the command line, edit WordPress Core files, and work with CRON jobs. If that doesn’t sound like your idea of a fun day at work, let me refer you back to Option 1 above. To properly configure WordPress HTTPS to work with your SSL certificate, you need to make some changes. You can do this manually…or you could use an awesome plugin that does everything for you. It’s called Really Simple SSL, and it lives up to its name. The plugin handles the whole process. Just install it and activate it. Be aware – you will naturally get signed out of WordPress when you run the plugin for the first time. This is because the plugin changes your default URL from “http://” to “https://.” All you need to do is log in again with your normal login credentials. No need to be alarmed! Once you are logged back in, you’ll see that the plugin has already made the necessary changes. The default options are often good enough. You find them under Settings – SSL. And if those aren’t good enough, and you want to tweak some more, the Settings tab is up top. The option you will likely be most concerned with is the first one: auto replace mixed content. The box should be checked by default. If not, check it. Then save the page. Now, you’re good to go. You have successfully installed and activated WordPress HTTPS and WordPress SSL. Congratulations! Just because things are installed and ready doesn’t necessarily mean they’re working smoothly. You may run into a few issues on your site. WordPress HTTPS sites are easy to troubleshoot, though. Let’s walk through the solutions to some of the most common issues. At some point, after you set up SSL on your site and move to WordPress HTTPS, you might end up seeing some broken images on your site. Images and content that once appeared perfectly on your site may not show as though they don’t exist. Don’t worry. You didn’t do anything wrong. Your site just thinks that those images are insecure (they’re not), so you want to make sure that the WordPress SSL is set up to display mixed content. Two different types of mixed website content exist. One is known as mixed active content and results when HTTPS loads a script on top of HTTP. This is a big no-no but is not what is going on here. The other type of mixed content is known as mixed display content and is when content using an HTTP connection is loaded to an HTTPS site. While you may not have actively loaded any images to your website using HTTP, there was something inside of WordPress that caused them to be recognized as such. Basically, something on your website didn’t like that you went to HTTPS and is automatically forcing HTTP on them instead. Which renders them…well, it doesn’t render them. So let’s fix that. The first and most consistent way to address mixed display content is to use the WordPress SSL Insecure Content Fixer plugin. Whenever you install and activate the plugin, your mixed content error may go away immediately. 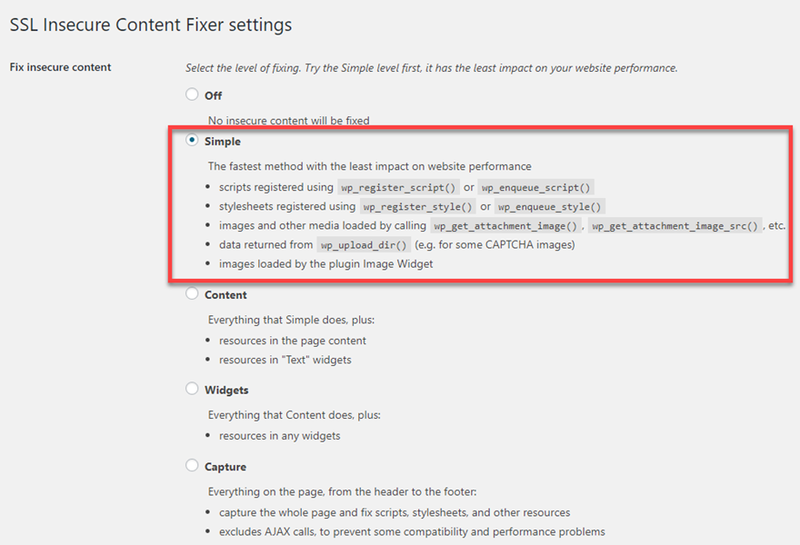 By default, the plugin will be set to the Simple ruleset within its settings (found under Settings – SSL Insecure Content in your WP admin panel). You can adjust how stringent the rules it follows are, all the way down to forcing HTTPS on all AJAX calls, but most of the time, Simple will work just fine. In my experience with this particular issue, Simple has worked each and every time. But your mileage may vary. Open up your website, right-click and select View Page Source or hit CTRL/CMD – U. You will see the source code of the page you’re looking at. At this point, hit CTRL/CMD – F and do a search for src="http. Yes, with only one quote. You’re good and can move on if you see 0.0. If you do get any results returned, that means that the site is pulling from an HTTP source, not HTTPS. To fix that, you need to dig into your database (but this one’s easy and anyone can do it). 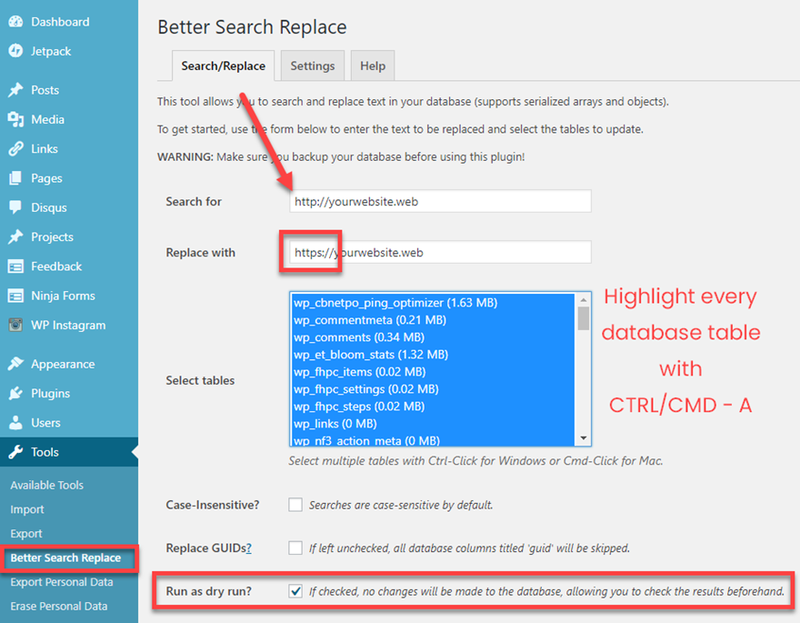 The Better Search and Replace plugin basically lets you work in your database via the WordPress admin panel. You don’t have to deal with any SQL or PHP or anything else. It’s a standard WordPress page that works like a typical find and replace you’ve probably used a dozen times in word processors. We have a full guide to the plugin that you can read here, but the breakdown for fixing your WordPress SSL mixed content error is pretty straightforward, too. If everything goes as planned, the dry run will show that your search and replace will be successful and you can run it for real. After that, you will need to get into your FTP client and open up your .htaccess file. It will be located in the root directory for your WordPress installation. That will redirect your old HTTP URLs to the HTTPS versions as your website loads. Note that in the code you’re putting [L, R=301], that’s a permanent 301 redirect through the .htaccess file. You won’t need a 301 redirect plugin if you do this. At least for the primary domain. Now, remember when I said they count as two sites? This fixes that. You have given the new WordPress HTTPS site all the link-juice and search ranking your HTTP site had. Now, make sure you keep it by telling Big Daddy G (that’s my pet name for Google these days) that you’ve moved into a safer, more secure location. Now, it’s time to load up the Google Search Console. 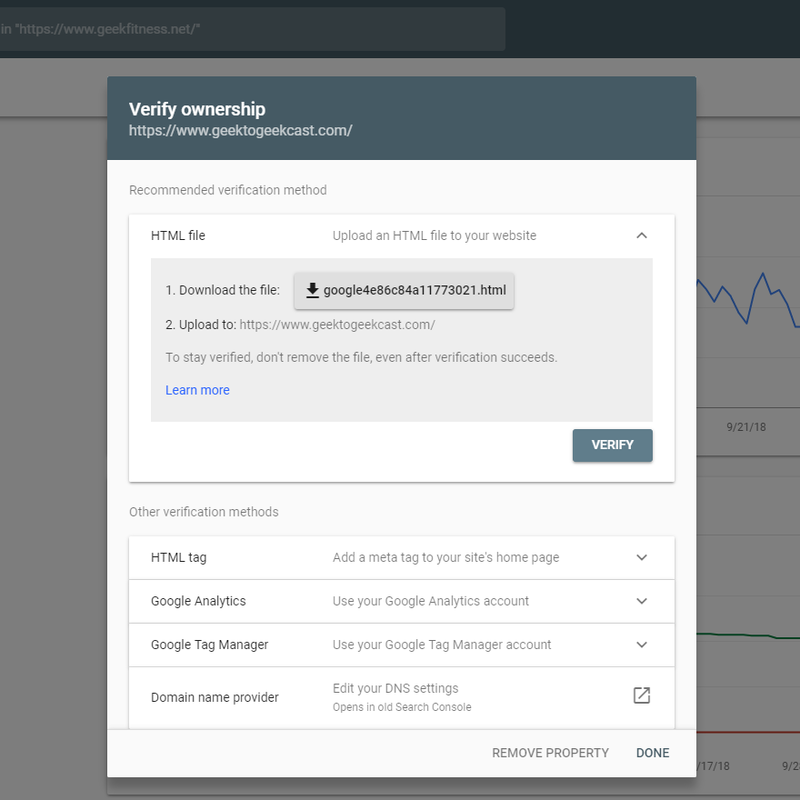 Even if you already have the HTTP version of your site registered with the Google Search Console, add the new WordPress HTTPS site as a new property. The Search Console will pop up a modal asking for the full URL of the site. This is where you must make sure to enter the HTTPS version. Note that even the modal tells you they are separate properties, just so that you are aware of how important this step is. Then you will go through the process of verifying the property as usual. When you’re done with that, Google will be aware that you’ve locked your site up from prying eyes. Once you’re verified with Google, and you’ve set up the Search Console with your new property, welcome to your new WordPress HTTPS site. You should be free and clear of errors that you can handle yourself. If you still have errors at this point, there’s a good chance that it’s out of your hands. Either an active plugin or your theme is the most likely culprit. To see which it may be, right-click on your page and select Inspect from the menu. You can also hit CTRL-SHIFT-I to open the developer tools. Look around until you see the tab labeled Console. If there are errors, you will see them highlighted in red. As you look at the errors, you will be able to see what kind they are. If there are any labeled as Mixed Content, you can look at the provided file URL to see what part of your installation is responsible. You can easily identify it. It will either be your theme or a plugin from the error’s output. Now, since you know what’s causing the error. The best thing you can do is report it to the plugin or theme author. Many have support forums or live-chat teams for just this reason. I recommend that you report it to the authors for a couple of reasons. The first being that messing around in plugin and theme files can get pretty nasty. Especially if you’re not a developer yourself. While you can tweak theme files much more easily thanks to child themes, you still have the chance of breaking something important you may be unaware of. And when it comes to plugins…well, we never suggest poking around in plugin files. It can get even nastier than the themes sometimes. The second reason being that you are not alone in this problem. You have it. Other people have it, too. That’s how these things work. So the developer needs to know about it and provide a fix via an update. So not only have you helped yourself with a problem, you’ve contributed to the greater good and can feel pretty darn good about yourself. Occasionally, a user may tell you that that your site is showing either an invalid certificate or an expired certificate. This is not a big deal. It’s an easy fix. 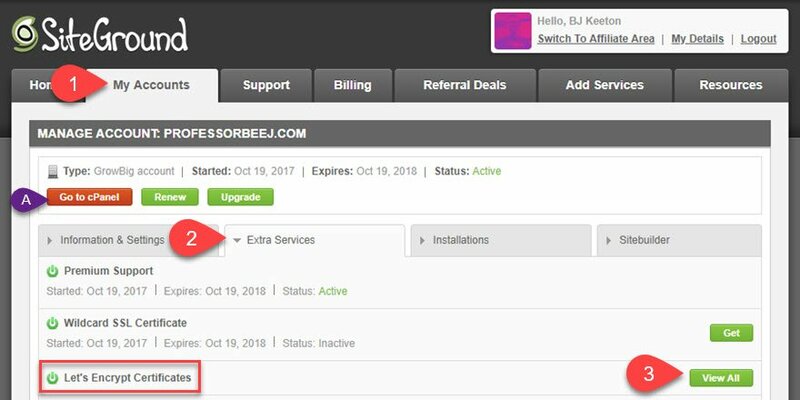 In general, to fix an expired certificate (or to renew one), you just need to go through the steps in the section above titled “Install Your Free SSL Certificate from Your (Supported) Host Account.” In most cases, that will work. If it does not, make sure you install the Wildcard Certificate because you may be getting the error because of a mismatched domain name. If that doesn’t work, contact your host. As I said earlier, I am personally on SiteGround. And when I had this issue with my SSL not automatically renewing, the support team had it fixed within half an hour. That will obviously change host to host, but they want your site online almost as much as you do. Save and upload it back to the server. Your site should now stop where it is supposed to. I know that’s a lot to take in. But WordPress HTTPS is really important for your site’s viability in the future. Users trust you more. And maybe more importantly, Google will trust you more, too. You’re now set to fix mixed content errors, handle SSL certificate expiration and renewal, edit your .htaccess and wp-config.php files, and even futz around with your site’s database. At this point, you have locked your site down. When something breaks with the WordPress SSL, you can fix it. Pat yourself on the back, go have a drink, and rest well knowing that your site is safe and sound. What WordPress SSL issues have you had in the past and how did you solve them? Great write up BJ! 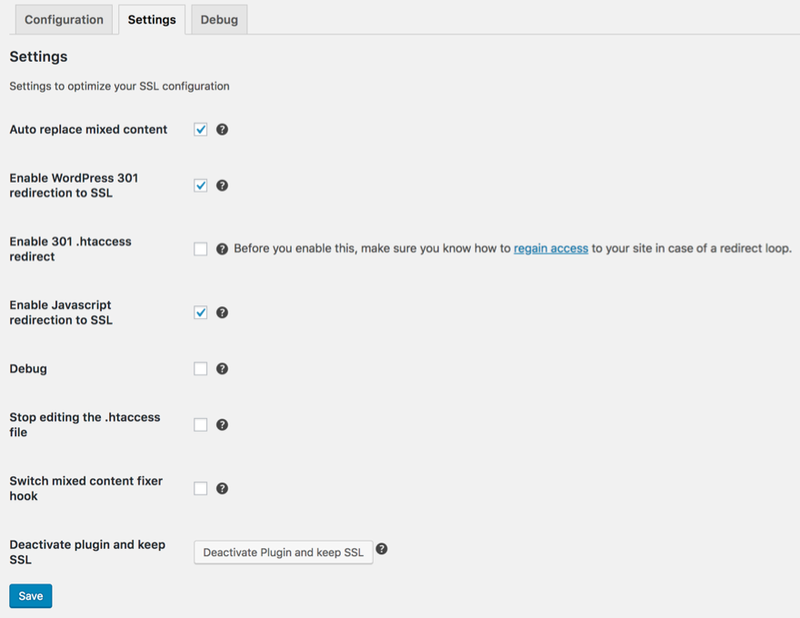 This is the most comprehensive article on configuring WordPress for SSL that I’ve come across! Your point about placing the Rewrite Rule code in htaccess at the top of the file can’t be understated. It has to come before the WordPress mod_rewrite, or it won’t actually work properly. Cheers. Great post, and complete, thank you. For non-English writers (I mean French), I also wrote an article on my blog about HTTPS and SSL certificates. I realize that we meet the same problems, and the same solutions, it’s reassuring! Many thanks for this Awesome guide! You covered every problem that I’ve ever run in to when making the switch to ssl. “A file with an insecure url of “http://xxxxxxxxx.com/wp-content/uploads/et-fonts/AvenirNext-Regular-08.ttf” was loaded on line: 776 of https://xxxxxxx.com/. It does look like that’s similar to mixed content. Have you tried the fix Insecure Content plugin or the Really Simple SSL option? If so, the next one I’d try is the DB search/replace for that particular URL. Or you may be able to add this code to your .htaccess file and see if that will work. Even the code tags didn’t like that, so I’ve added some spaces after opening flags. Log into your cPanel for your hosting and go to PhpMyAdmin. Click on the database for your site and go to the wp_options table. The top two table options will show your URL. Click on the edit link and make sure that the URL has the HTTPS:// appended to the beginning. Now log back into your WordPress site and go to Settings > Permalinks and click the save button two times. Check your frontend of the site and see if you are still getting the error. This is the method that I have used every time I receive this issue and it takes care of it within just a few clicks and a couple of minutes tops. Great guide however you fail to mention HSTS (HTTP Strict Transport Security) there’s a small window of opportunity for would be attackers to exploit the 301 redirect from http to https connection. Using the HSTS directive forces browsers to use https regardless of whether someone just types in the www or http://. Hi!, first of all I have to say that it’s an article so complete with so many info. I think that the SSL certificate it’s so important in a website, even if its a ecommerce or a normal website. It reflects trust for the visitor. Thanks a lot for sharing!. An interesting item this article does not appear to mention is that using Better Search Replace as an http -> https utility seems unable to find a couple of rather common Divi related items. BSR is my go-to utility for handling this situation, and I use it right after manually changing the 2 database options for “home” and “site url”. That’s usually enough to gain rational access to the site in order to finish the task with the BSR utility. It seems that BSR cannot seem to locate the URL links for Fav Icon and Logo, located in the Divi -> Theme Options -> General tab. Easy to fix of course, but they must be stored in such a way that BSR cannot unpack and locate them. Usually I notice that the pages render as HTTPS with a “broken” lock icon, indicating that not all the content was served (requested really) as HTTPS. Inspecting the source code of the page, if I see that it’s the Divi injected logo or the favicon reference, I know to go back into the Divi theme options area I mentioned above and add the SSL “s” to the http://blah.blah.com request. Doing that and saving the options usually does the trick. Wonderfully explained – straightforward and thorough! I’ve been in the process of adding SSL certs to my client sites over the past few months, and still have more to complete. You hit on points/action items I follow, so it confirms I’m doing the right things, and I also appreciate the additional details in case something doesn’t happen the way I intended. Great checklist for the whole process – thanks for this! Stay away from Really Simple SSL, a cleaner option is to run a search and replace in the site database running http to http. WP-CLI has a search and replace option as well. Why stay away from really simple SSL? Whats wrong with Really Simple SSL? A few months ago Google is starting to show the AMP problems in your search console. If you have the plugin AMP and the plugin Really Simple SSL activated, you will see notifications in your Google Searchconsole. Apparently the plugin Really Simple SSL will put some script, which force the page to https, in the header of your page. This will give the AMP critical notifications by Google…At least this was the case in August when I received lots of notifications about the AMP problem. Curious on why you would stay away from this plugin. Some users aren’t comfortable with search and replace in their site database and Really Simple SSL is a nice option. I agree with Luke, and would not use any plugin to force SSL. IMHO the best option is to use Better Search & Replace, which has resolved the problem for me on most of the sites I have worked on. If there are still issues I just use All in One WP Migration to export the site and then import it (via HTTPS of course), problem solved. Granted this is a little riskier because imports hang sometimes, but it works for me over 90% of the time. Besides, you always do a backup with All in One WP Migration before doing any search and replace on your database, right? So you already have the backup ready to go. However, just to be safe, I always make a full backup of the files via FTP and the database using phpMyAdmin. I have only had to restore using this method a couple of times, but creating multiple backups sure saved me a lot of grief on those projects. I agree with Luke and James. By using the plugin then you’re bound to keep it forever. If you or anyone else removes the plugin, i.e a year after the migration to HTTPS, thinking it has done its work then you’ll have to deal with the issues the plugin dealt with. I agree with Luke & James. Once you have activated the plugin then you’re bound to keep it forever. If you, or anyone else, decides to remove the plugin a year after the migration, thinking it’s not needed anymore, then you’ll have to deal with all the issues the plugin dealt with. Hi. Could all these procedures be applied to a site in a local server? Although I’m not sure if I would be able to make it. I bought my suscription to Elegant Themes and I was trying to start my first WordPress site in Wamp after years of developing in HTML and CSS. But when I try to open the site and follow WordPress’ configuration process it gives an error saying that it can’t find the database. Neither the site. One of the alerts that popped up said that the issue could be the site not being https. Thanks! From experience when I do a backup of my site to a local machine on MAMP I have to disable the SG Optimiser which can be used with Site Ground’s implementation of Lets Encrypt to configure HTTPS and the SSL certificate, otherwise the site won’t load properly. So maybe you are experiencing something similar. A few weeks ago I moved to Cloudfare and have noticed my google ranking drop. After researching it I discovered that this is common until google reindexed the new URL! There’s an option in the Search Console to request a re-index. I’m not sure how high of a priority you’re given, but if you do that, it hopefully won’t affect you as drastically or for as long. Always prepare and submit a new sitemap! Keep your old one too for at least a few weeks, and set up proper 301 redirects. Sitemaps are the one thing I forget to do more than anything else. And have for as long as I can remember. They are so important. Thanks for the note! Thanks for outlining issues regarding SSL. How does converting to SSL affect Google Analytics? It shouldn’t affect it at all if you have the property registered in Google Search Console as a new property, and use a 301 to push to HTTPS. I never had a single issue in terms of lost data with any of my sites. In my experience it has no effect, good or bad. Nice article giving clear concise and simple instruction on using HTTPS and the free services. I have been using lets encrypt for a while now with no problems. Thanks you so much, my website is not secure, I was searching for this tutorial to make my website secure. Now I will use this article for SSL on my site. Your post came literally on the day I decided that I needed to move to SSL. I’ll admit it was not fun, BUT, your article showed everything to do. I followed the instructions exactly (as I had every issue you identified at some point), and am now all secure. Could NOT have done it without your fantastic post. Can’t thank you enough! Thanks for sharing, SSL for wordpress.. I am new in digital marketing and know that SSL make website secure. But i am little bit confused, Does SSL help in improving the ranking in SERP. your post will really help me in installing the SSL on wordpress. Nice post about the SSL for wordpress website.. I have found the complete guide to install the SSL Certificate on wordpress site.. Does SSl Help in improving the position in SERP? This is the best article I’ve seen on this subject. Great job! I have the Lemon Tuesday font installed via the page builder and since installing the SSL, when I use https:// the font no longer works. I have searched everywhere for a place to update this font and cannot find one.. I checked for src=”http in the source file and nothing comes up in regards to the font. I’ve done everything including change the .htaccess page. What now? Any suggestions? The Better Search Replace, doesn’t mention this file. Great post about the SSL for wordpress website.. Your post will help digital marketing expert and web developer to install the ssl certificate on wordpress site..
How to solve the issue of content mixing after installing the SSL?